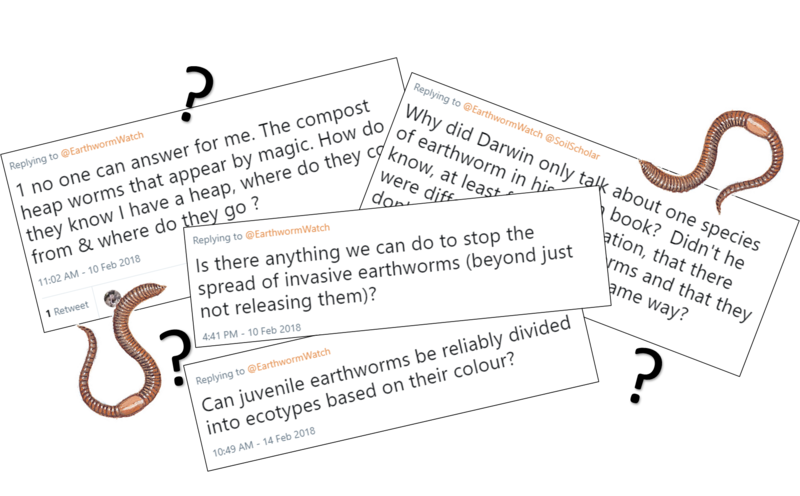 I was really pleased with the variety and depth of questions asked on the Twitter earthworm Q&A. If you were not able to take part here is a summary of the questions and answers. What is your favourite earthworm species? Octolasion cyaneum! I think this is the UK's most beautiful earthworm. It's quite large, mostly pale blue with a pink saddle and yellow tip to the tail. Is there anything we can do to stop the spread of invasive earthworms (beyond just not releasing them)? Tough one! I think only good biohygiene not to move them around will do. I thought about introducing natural enemies such as parasitic flies or protozoa but this has risks & I don't think it would impact the populations enough to make a difference. Can juvenile earthworms be reliably divided into ecotypes based on their colour? Why did Darwin only talk about one species of earthworm in his worm book? Didn't he know, at least from observation, that there were different species of worms and that they don't all inhabit the soil the same way? This puzzles me too. Darwin never identfies his earthworms to species, even though we can recognise some species by his description of their behaviour. I guess he was more interested in what they do rather than what they are? 1 no one can answer for me. The compost heap worms that appear by magic. How do they know I have a heap, where do they come from & where do they go ? Good question! Compost earthworms are found in small numbers in other places (I have found them in leaf litter, manure and rot-holes) - I suspect they 'smell' the heap & travel to it then and breed rapidly in the ideal conditions. It would be great to research how this actually happens though. Do they really eat their way through soil as they burrow? Yes the soil-feeders or endogeic types do. They digest the plant material, microbes, small animals such as nematodes & excrete the rest to form burrow walls & castings on the soil surface. Another wormy question! Is anybody studying the microbiome of earthworm guts? I bet they have a whole separate microbiome in their external slime too, is that being studied? If you have any burning questions about earthworms let us know by leaving a comment and we will cover it in another blog post!